The European Olympic Committees (EOC) today held its first meeting of 2017 with IOC President Thomas Bach in attendance. 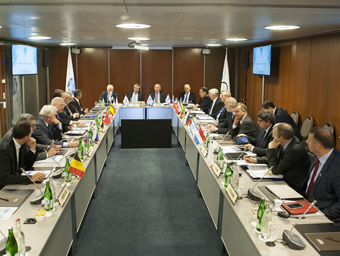 The meeting’s key outcome was the appointment of Spyros Capralos as Chair of the EOC Coordination Commission for the second edition of the European Games in 2019 in Minsk, Belarus. EOC Acting President Janez Kocijančič opened the day’s proceedings in Lausanne by welcoming President Bach and thanking him for his guidance of the Olympic Movement throughout 2016. President Bach then gave an update on the IOC’s latest activities, especially in the area of anti-doping, and answered questions from Executive Committee members. “It was a great honour to have IOC President Bach attend our first meeting of 2017 in the Olympic capital. President Bach provided a full update on all current key issues from across the Olympic Movement and, in response, the EOC Executive Committee expressed our unanimous support for the IOC’s handling of the completed McLaren Report concerning doping in Russia. Following President Bach’s departure, the Executive Committee received reports from Secretary General Raffaele Pagnozzi, Treasurer Kikis Lazarides, and European Games Senior Consultant Pierce O’Callaghan. Capralos’s appointment as Coordination Commission Chair for Minsk 2019 was then confirmed by unanimous approval from members. Capralos, the President of the Hellenic Olympic Committee, is taking on the same role he occupied from 2013-2015 for the inaugural European Games in Baku, Azerbaijan. The first Coordination Commission visit to Minsk is expected in the spring. The Executive Committee also received positive progress updates about the upcoming Winter European Youth Olympic Festival in Erzurum, Turkey, which is taking place from 11-18 February. Acting President Kocijančič praised the Turkish Olympic Committee and the Erzurum 2017 Organising Committee for their hard work in staging the event just two years after agreeing that Erzurum would host the event in 2017 rather than 2019, as had been originally agreed.